Confession time... 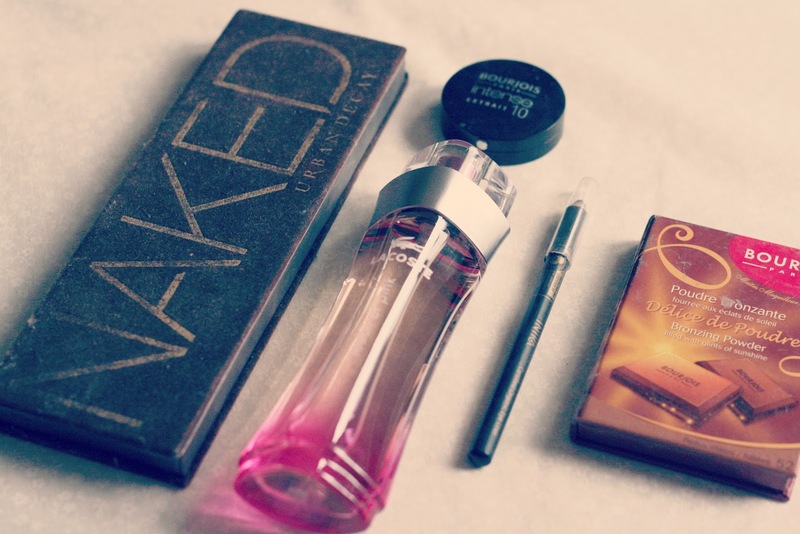 I spent some money on makeup! Do you know how I justified it......because we needed to spend X amount to qualify for free parking at the Swindon Outlet, terrible aren't I! I totally blame Tom.. There I was casually browsing the shelves of the CCO, looking at all the pretty bits of makeup but knowing deep down I wasn't meant to be buying anything when a little voice behind me chirps up and says 'You know we just need to spend £18 more and we get free parking....Just throwing that out there" What is he like! 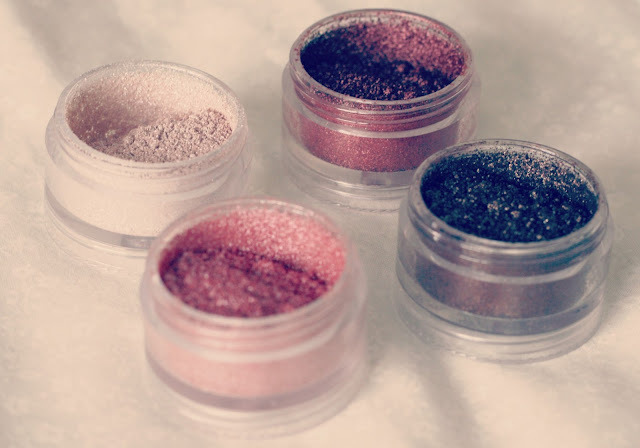 Well with that I picked up this gorgeous Dazzlesphere Smoky Berry pigment set and made a beeline for the till. Since Mac's Cranberry eyeshadow was in the spotlight throughout the winter months it made me crave some berry tones in my collection, this cute little set just fits the bill. 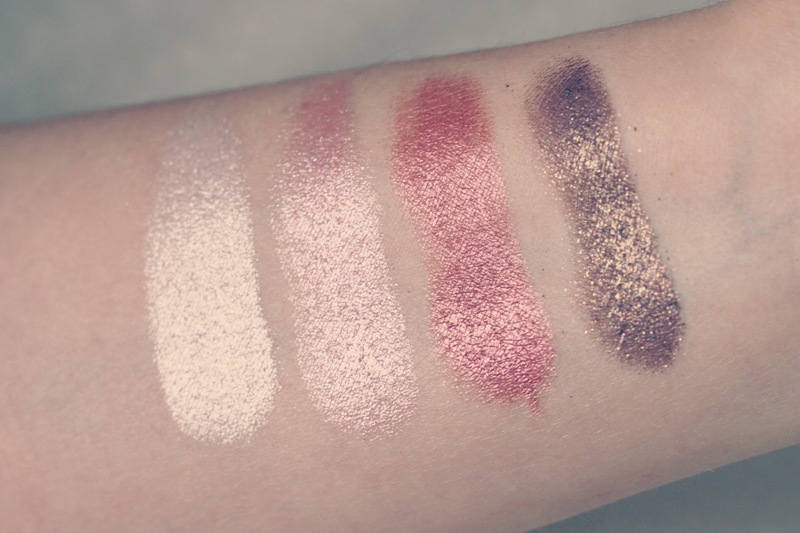 Apologies that there are only arm swatches but I wanted to show you just how gorgeous the colours are. Used on their own or combined they look absolutely stunning. I'm hoping to do a few 'face of the day's or something along those lines to show these off in the next few weeks or so. 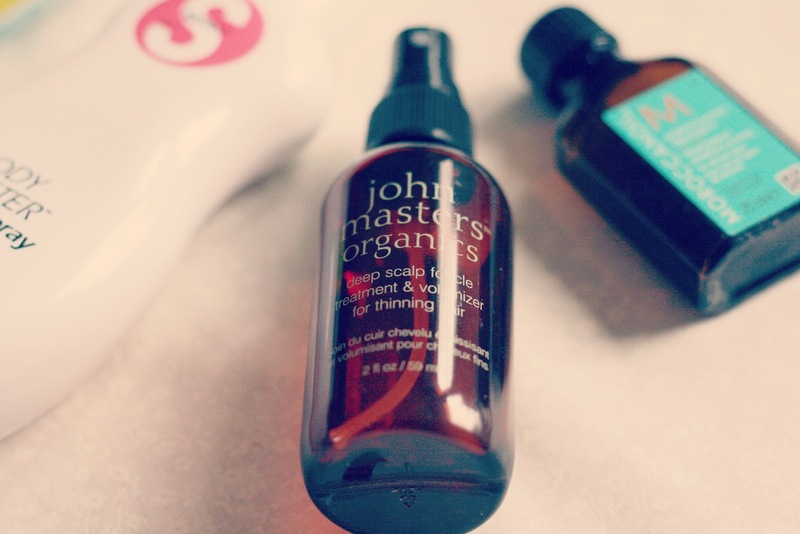 Do you shop in your local CCO to try and hunt down some beauty bargains? Love Lammie Travel Washbag - c/o Not on the Highstreet. Weddings are expensive, as most of you know I will be 'tying the knot' later this year, and in order to help us have everything we want on our big day Tom and I moved out of our flat so our rent could go into the wedding fund each month, rather to a landlord! By doing so it means that Tom and I aren't living together at the moment but I do spend every weekend at his, therefore I need some thing to lug around my beauty essentials each week, Yes I could leave a selection of things at his, but what if I want to use said items during the week?! Oh dilemas! This Travel wash bag is perfect for taking my beauty bits back and forth. As you can see from the photo's it can hold a lot of products - admittedly I cant fold it back up properly but what do you expect from a beauty blogger! There are 3 different compartments, two of which are see through, which I find the most handy when I'm packing everything into it. It means I don't duplicate items and know what I've already thrown in there. I attempt to take the bare minimum but I'l be honest I end up taking more than I actually need! I'm pretty sure we all do this! Love Lammie have 3 different patterns to chose from. The more understated polka dot ones, and then this one which screamed very Cath Kidston-esque when I saw it online. 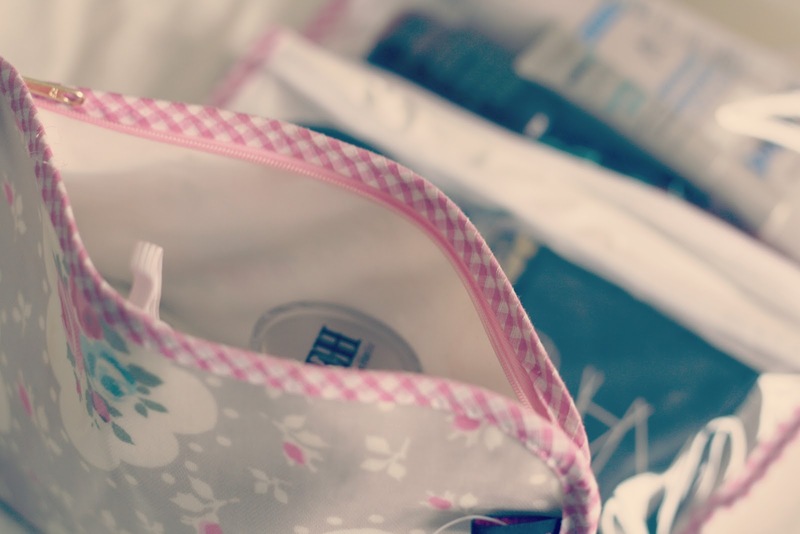 I actually spotted their smaller make-up bags in this print first, but realised that the travel wash bag was a much more practical choice considering my current living situation! 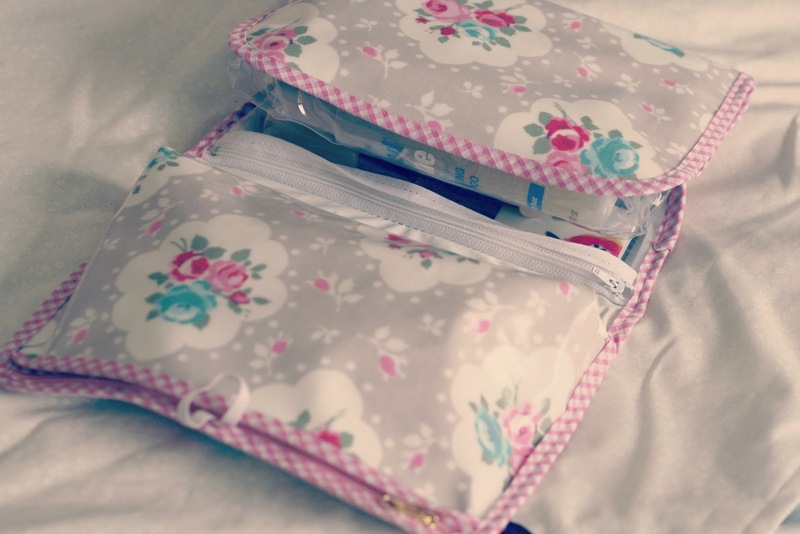 At £20 + postage I feel that it is a very reasonable price for a travel wash bag of this size, the pattern is cute, and now I want to get some of the other items to have a matching collection! Currently have my eye on the hot water bottle! Perfect for these snowy days! I do love Not on the Highstreet for finding gems like this from independent sellers. I often have a browse in the wedding category to see if there's anything I can purchase to add an extra magical touch to our day! I know we all love our Real Techniques brushes, but sometimes its nice to mix things up a bit with another brand. Eco Tools have been on my radar for a while, Having used a couple of brushes in the past, and seriously lacking in the eye brush department, I decided to pick up the 6 piece travel eye brush set. Sometimes I prefer buying these sets. They are good value for money and the only difference to full size brushes is the handle length! I can work perfectly well with the shorter lengths! Eco tool is stocked in boots, however I headed over to trusty Ebay to purchase mine. This cute little set is perfect for travel, not only does it come with a mirror - I always forget to put a mirror in my bag! 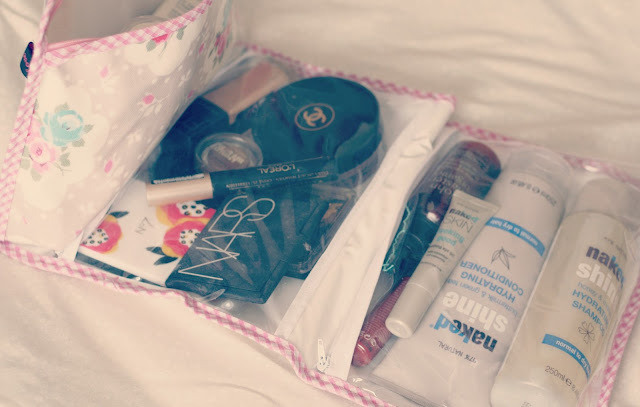 - the whole thing folds up to about the same size of my mobile phone (samsung galaxy S2), meaning it doesn't take up too much space in my travel makeup bag! In regards to the brushes themselves, as you can see from the photos above you get a good selection of different brushes. If you are a bit of a newbie to make up, Eco tools have labeled each brush for you. 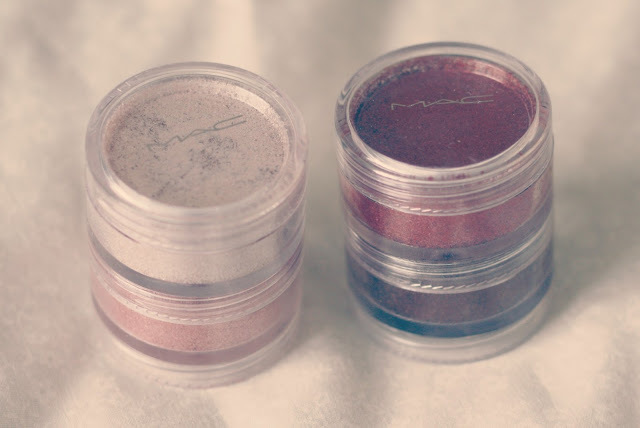 You've got a couple there that are good for packing the shadow all over your lids, others I prefer to use for more precise areas like the outter 'V' or adding some shadow along the bottom lash line. 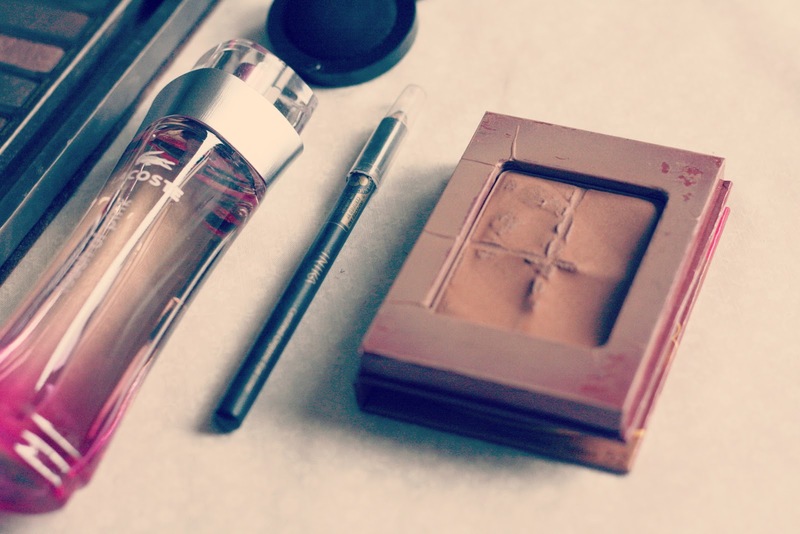 My favourite has to be the brush labeled up as the 'Highlight' brush. 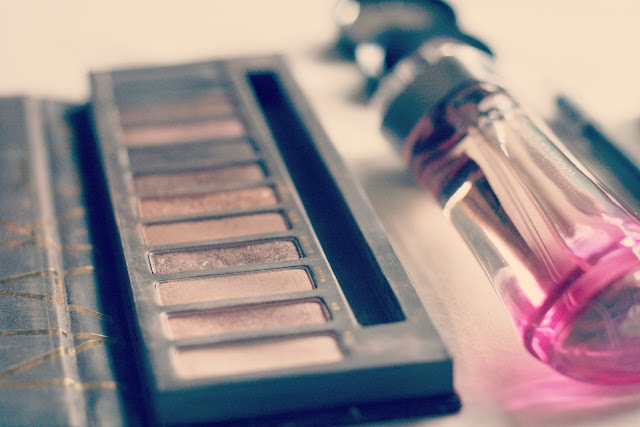 This particular brush is great for blending, removing the harsh lines! They are all extremely soft and they do not shed! - I have a couple of brushes that shed so badly, I'm literally picking little hairs off my face all morning - I should really part ways with those ones! Overall I am really pleased with this little set, for under £8 I think it's great value for money. The Ebay seller is realiable, and the despatch time was quick. If you don't need an eye brush set, they stock a lot of the other brushes, I use the angled eyeliner brush for my eyebrows if anyone wants another reccomendation! Have you tried Eco Tools brushes before? 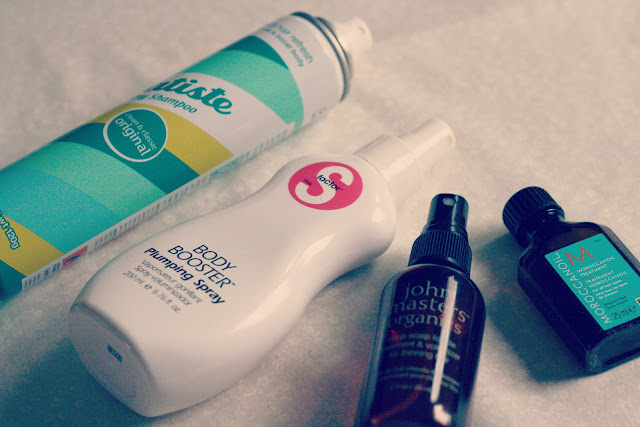 It became apparent on my rediscovering beauty faves post, that a lot of you are thinking along the same lines as me when it comes to our beauty collections. We are all guilty of it, buying too much and hoarding items that we really should just say bye to. I've made it clear that this year is all about using what I've got and not getting sucked in by advertising or blog hype, I do want to downsize my makeup collection, lotions & potions etc, so I thought I'd start of easy and dig out my HUGE collection of nail varnishes and get stuck in. At the time, I counted about 83 nail polishes in total. Now for me that is a lot! - To be honest there are probably some more lurking about the house, but I was focusing on the massive pile of them I had shoved in my room. Anyway.. There was a lot there, as I ex nail biter, I would never imagined I would ever own this many bottles of nail varnish, but I got over my bad habit and well...went a bit crazy clearly! My first plan of action, was to go through and just chuck the ones that were beyond repair. What I mean by that is, when your nail varnish starts to go a bit gloopey, you can usually save it (if you do it in time) by pouring a tiny little bit of nail varnish remover into the bottle and give it a shake. This usually restores it back to its original consistency and you can get a few more uses out of it. So I went through my stash and threw away the ones that were past this point.. there was no way of saving them.. They were goners! By doing this step I managed to get rid of about 7 polishes.. not a lot, but that's 7 less than I originally had so I was onto a good start! The second plan of action... Look for colour dupes. We have all done it. Bought a nail varnish, got home and then the realistation sinks in that you didn't need to buy that shade because you already own others that are basically identical! Its okay. We all do it. Any dupes I found I just put into a pile to palm off to my Sisters/Mum. By doing this I managed to clear out a good selection of nail varnishes. Finally, this is where you have to be a bit ruthless, and ask your self 'Will I use this/Do I actually like it?'. Quite often I have bought shades because they were on offer so I just randomly picked any old colour that I thought I didn't have in my stash just because it was free, or on 3 for 2. This has led to some rather questionable shades! This is where I really went to town and got rid of a ton of nail varnishes! The pile for my Sisters/Mum dramatically grew. By following these three steps I took my collection down from 83 to 48. Now I admit, this is still a lot of nail varnishes, and by no means a minimal collection - which is something I would love to eventually achieve! But I feel pretty pleased with myself that I managed to get rid of 35 nail varnishes! Now if only I had the same approach to the rest of my beauty products and we will be laughing! Is this something you would like to do or have maybe you're one step ahead and you've already done it? Hopefully this has spurred you in the right direction! 'Freak Out' - Models Own. You know when you see something in a youtube video or featured in a blog post and you instantly want it? That was the case with this nail varnish. When the mirrorball collection first came out I wasnt too fussed, then 'freak Out' kept cropping up on blogs, in instagram photos and being mentioned on youtube. The more swatches I saw the more I wanted it. I pointed it out to Tom a week or so before Christmas, well I showed him the empty space on the shelf where it should have been! It turns out from that day up until the 24th December he searched the multiple Boots stores in the town where he works and this particular one was always out of stock. so he couldnt get it for me for Christmas. Sadface! However the other day I was mooching about boots, as you do and it was in stock! So i managed to pick it up. Obviously Tom was a bit miffed as he had spent so long trying to find it and then I go into the first Boots I come across and there it is staring at me! Models Own Freak out is full of glitter, You've got small purple circles, blue pentagons some aqua shards (I guess) and also some aqua strips! - Don't you just love how I dissected the different glitter shapes there? Because its more a of a blue based glitter top coat, I have been wearing it over a variety of blue nail varnishes! Literally so glittery and garish on every nail but I LOVE IT!